A list of XML attributes used by saveElement and startSaveElement. Definition at line 276 of file CCopasiXMLInterface.h. Definition at line 502 of file CCopasiXMLInterface.cpp. Definition at line 507 of file CCopasiXMLInterface.cpp. Definition at line 512 of file CCopasiXMLInterface.cpp. Definition at line 321 of file CCopasiXMLInterface.h. Referenced by add(), CCopasiXML::save(), CCopasiXML::save1DAttributes(), CCopasiXML::save2DAttributes(), CCopasiXML::saveAnnotation(), CCopasiXML::saveArrowHeadAttributes(), CCopasiXML::saveColorDefinition(), CCopasiXML::saveCurve(), CCopasiXML::saveDimensions(), CCopasiXML::saveEllipseElement(), CCopasiXML::saveFunctionList(), CCopasiXML::saveGradientAttributes(), CCopasiXML::saveGradientStop(), CCopasiXML::saveGUI(), CCopasiXML::saveImageElement(), CCopasiXML::saveLayoutList(), CCopasiXML::saveLinearGradient(), CCopasiXML::saveLineEnding(), CCopasiXML::saveLocalStyle(), CCopasiXML::saveModel(), CCopasiXML::saveModelParameter(), CCopasiXMLInterface::saveParameter(), CCopasiXML::savePlotList(), CCopasiXML::savePosition(), CCopasiXML::saveRadialGradient(), CCopasiXML::saveRectangleElement(), CCopasiXML::saveRenderInformationAttributes(), CCopasiXML::saveRenderPoint(), CCopasiXML::saveRenderTextElement(), CCopasiXML::saveReportList(), CCopasiXML::saveReportSection(), CCopasiXML::saveSBMLReference(), CCopasiXML::saveStyleAttributes(), CCopasiXML::saveTaskList(), CCopasiXML::saveTextAttributes(), and CCopasiXML::saveTransformationAttributes(). Definition at line 524 of file CCopasiXMLInterface.cpp. Definition at line 342 of file CCopasiXMLInterface.h. References CCopasiXMLInterface::encode(), mAttributeList, and mSaveList. Erase the content of the attribute list. Definition at line 514 of file CCopasiXMLInterface.cpp. 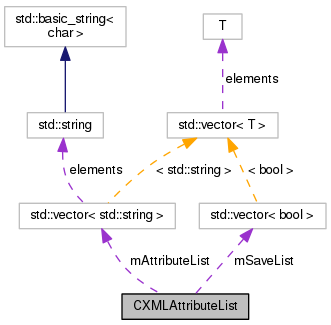 Referenced by CCopasiXML::saveCurve(), CCopasiXML::saveDimensions(), CCopasiXML::saveFunctionList(), CCopasiXML::saveLayoutList(), CCopasiXML::saveModel(), CCopasiXML::savePlotList(), CCopasiXML::savePosition(), CCopasiXML::saveReportList(), CCopasiXML::saveSBMLReference(), and CCopasiXML::saveTaskList(). Retrieve the indexed attribute (' name="value"' or '' if skipped). Definition at line 550 of file CCopasiXMLInterface.cpp. Retrieve the name of the indexed attribute. Definition at line 538 of file CCopasiXMLInterface.cpp. Retrieve the value of the indexed attribute. Definition at line 541 of file CCopasiXMLInterface.cpp. Definition at line 397 of file CCopasiXMLInterface.h. Definition at line 410 of file CCopasiXMLInterface.h. Definition at line 531 of file CCopasiXMLInterface.cpp. Definition at line 444 of file CCopasiXMLInterface.h. Referenced by CCopasiXML::saveAnnotation(), CCopasiXML::saveFunctionList(), CCopasiXML::saveGUI(), CCopasiXML::saveModel(), CCopasiXML::saveReportList(), and CCopasiXML::saveSBMLReference(). Definition at line 456 of file CCopasiXMLInterface.h. Definition at line 522 of file CCopasiXMLInterface.cpp. Set whether the indexed attribute shall be skipped during save. Definition at line 544 of file CCopasiXMLInterface.cpp. Referenced by CCopasiXML::saveModel(), and CCopasiXMLInterface::saveParameter(). Definition at line 283 of file CCopasiXMLInterface.h. Referenced by add(), erase(), getAttribute(), getName(), getValue(), operator<<(), set(), setName(), setValue(), and size(). The list whether an attribute is to be saved. Definition at line 288 of file CCopasiXMLInterface.h. Referenced by add(), erase(), getAttribute(), operator<<(), set(), setValue(), and skip().